Fall is in the air. The mornings are crisp and cool, and at higher elevations, speckles of fall colors amid the summery green have begun to emerge. The woods have fallen silent as birds hunker down and ready themselves for their great migration. Photosynthesis also slows to a stop. For the winter, the bright green, sugar-producing factories within the leaves shut down, giving those red, orange, and yellow pigments time to shine. Not long from now, a blanket of fall-ripened leaves will be scattered along the Northeast’s trails. 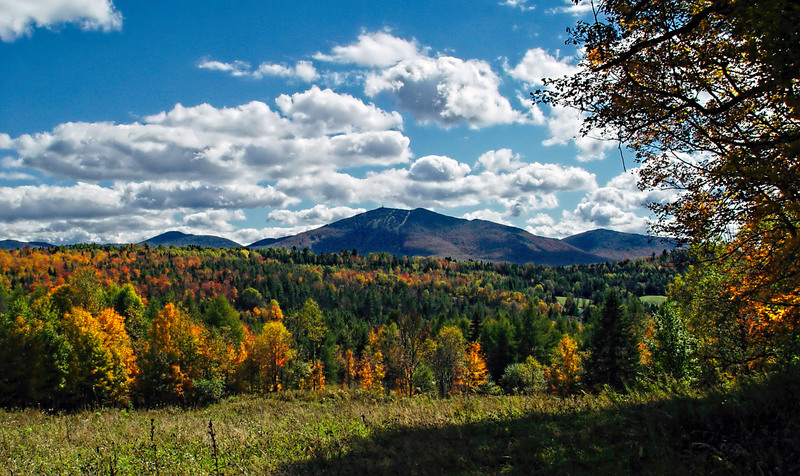 It’s officially leaf-peeping season, the best time of the year to hike and climb. Those pesky black flies are gone, the air is the perfect temperature, and the scenery is unmatched. 2017’s fall foliage predictions are promising. 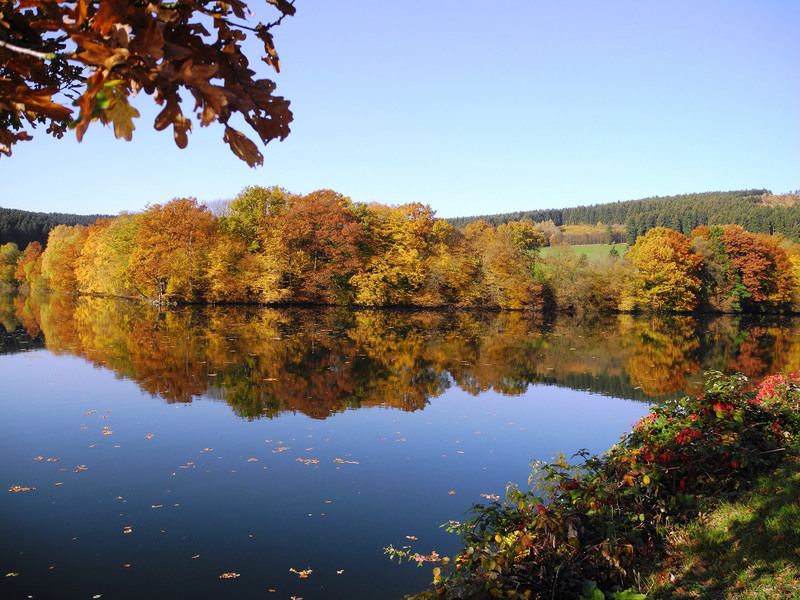 If September weather permits, we may be looking at a particularly vibrant autumn. While the 2016 drought would normally affect the forest unfavorably, the several large snowfall events followed by warming this past winter resulted in plenty of snowmelt to recharge the soil moisture, leading to healthy forest foliage over the summer. Typically, trees stressed by drought cause the leaves to change earlier. However, fall’s projected higher temperatures combined with sun and cool nights could counteract this pattern by delaying foliage change. Therefore, this season’s peak foliage timeline is very close to the average. When will the foliage peak? Based on the National Fall Foliage Prediction map, the Northeast’s first peak foliage period starts later this month. These estimations all depend on the weather from September through October. 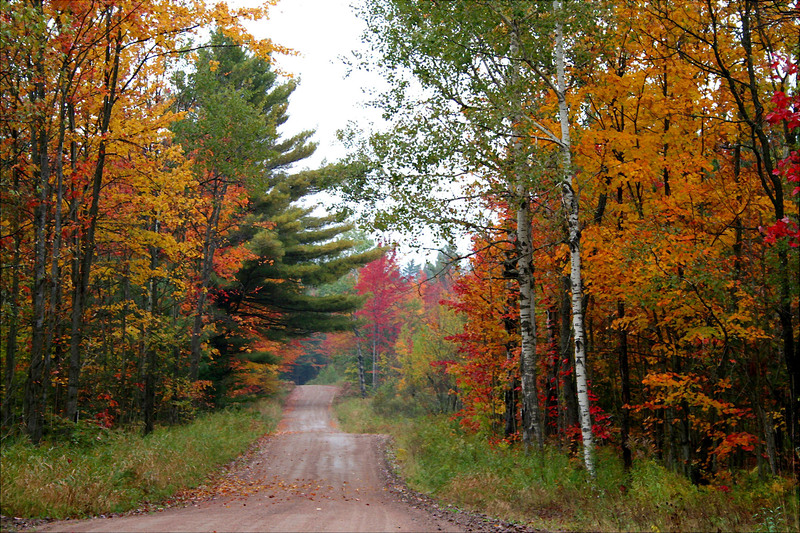 So, before planning your fall trip, check the weekly foliage report to get the most up-to-date information. Where can I see the best fall foliage? A small mountain town in the Northern Adirondacks’ High Peaks Region, the Village of Lake Placid is situated on Mirror Lake and has plenty of shops and restaurants to explore. Just six miles out of town, you can find the Adirondack Loj at Heart Lake. For an easy hike with relatively little effort, head to the summit of Mount Jo, a 2.6-mile round-trip hike with spectacular views of the High Peaks. Epic views from the top are, in fact, screensaver worthy. And, that’s no joke: Apple has a fall scene from the top of Mt. Jo as one of their screensavers. If you are looking for a more challenging hike, the High Peaks are accessible from the same parking lot. A historic mountain town in the heart of the Catskills, Woodstock prides itself on fostering a connection with art and nature. Here, Overlook Mountain has been an important spiritual centerpiece, and this hike up has no shortage of interesting features! 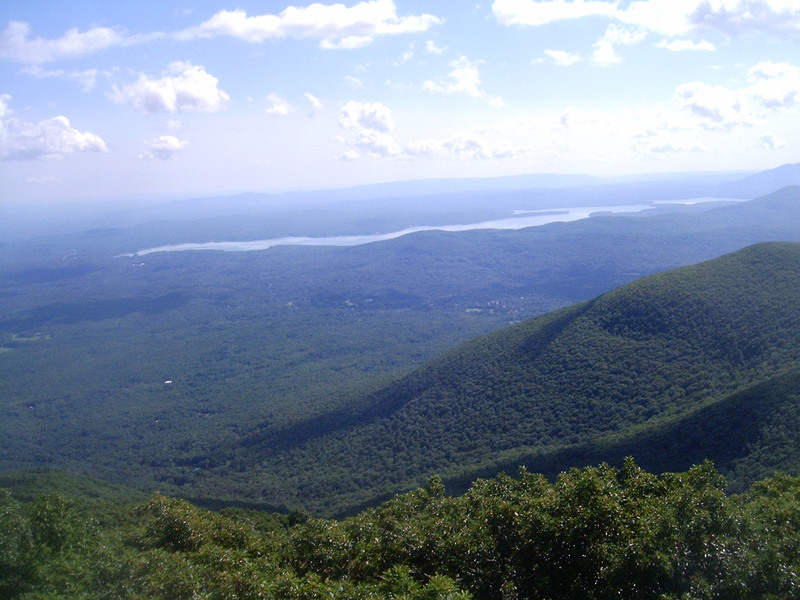 In fact, a fire tower at the top looks out over the gorgeous Hudson Valley. At its base sits a Buddhist temple for hikers to respectfully explore. On the way up this gentle grade, you will run into the remains of the Overlook Mountain House. 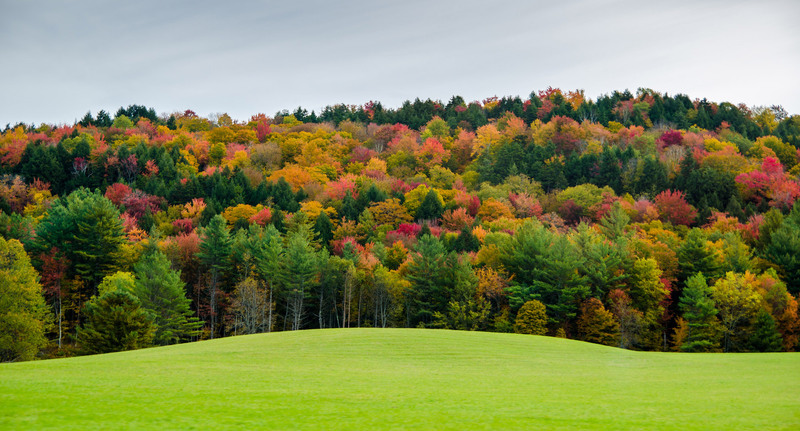 Stowe, VT is well known for its picturesque fall scenery and outdoor recreation during the winter. This quaint, warm town has everything from biking and hiking to art events and museums. The Pinnacle hiking trail is a 3.1-mile round-trip beginner hike near Stowe and offers a view of Mount Mansfield that will knock your socks off. Alternatively, for more of a challenge, you can hike Mount Mansfield itself—an eight-mile loop—that will get you to the very top of Vermont at 4,393 ft. There are, of course, hundreds more locations where you can view the Northeast’s fall foliage. Even a simple walk in the woods or a car ride down an old country road can be a breathtaking experience. Just get out there, wherever you can, and try to enjoy the fall colors! As the water temperature rises, so does the anticipation of paddling and exploring new rivers and lakes. Touring through our vibrant natural communities is a wonderland for the senses: the relief of a cool breeze on a hot day, the smell of blooming flowers along the riverbanks, the underwater ripples that reverberate against your boat as fish swim beneath, and the fluttering of foraging birds through the brushy shoreline. But, the spread of invasive species can endanger these experiences. For those that don’t know, invasive species are exotic plants and animals that become established in areas outside of their original range. Once there, they choke out native flora and fauna. Particularly, aquatic invasive species restrict important ecosystem processes that define the beautiful landscapes we explore each summer. They obstruct waterways and irrigation canals and can impede water recreation. This occurrence has significant economic and ecological impacts and can be a headache to paddlers and outdoor recreationalists. How do I prevent the spread of invasive species? Make sure to thoroughly check your boat for common invasive species (see our guide below for identification). Especially review all possible attachment points where vegetation or mud could get caught or accumulate. For a kayak, rudders and skegs can pull up vegetation, while stand-up paddleboards often get it caught in the fins. Additionally, invasive mussels can attach to any surface on your boat. Thus, once you’re done, run your hand along the side. If it feels like sandpaper, you may have zebra mussels attached. Also, make sure to assess all gear you brought along. Before leaving the site, clean off any mud, vegetation, fish, or animals that may have attached to or gotten inside of your boat. These can be discarded in an upland area, preferably at an invasive species disposal station. For reference, you can find these locations near a water access site. However, certain mussel species are difficult to remove and require exposure to water or steam that’s at least 140° F. Exposure first kills them, and then, they can be removed with a brush or pressured water. 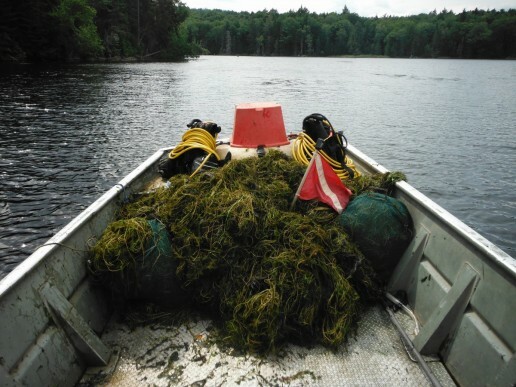 For this purpose, the Aquatic Invasive Species Prevention Program through the Adirondack Watershed Institute has a number of decontamination stations situated throughout the Adirondack Park. Before leaving the access site, drain any water that may have gotten inside of your kayak or canoe. If you have a live well or any other compartments that may have taken on water, drain them, too! Before you use the boat in another body of water, let it, any compartments, and other equipment dry thoroughly first. Asian clam: Asian clams vary from light tan or brown to black-brown. They are very small (<20 mm) and somewhat triangular in shape. Zebra and Quagga mussels: The Zebra mussel is a small shellfish (<50 mm) named for the zebra-like stripes covering its shell. It is triangular in shape and is often found attached to surfaces or other mussels. 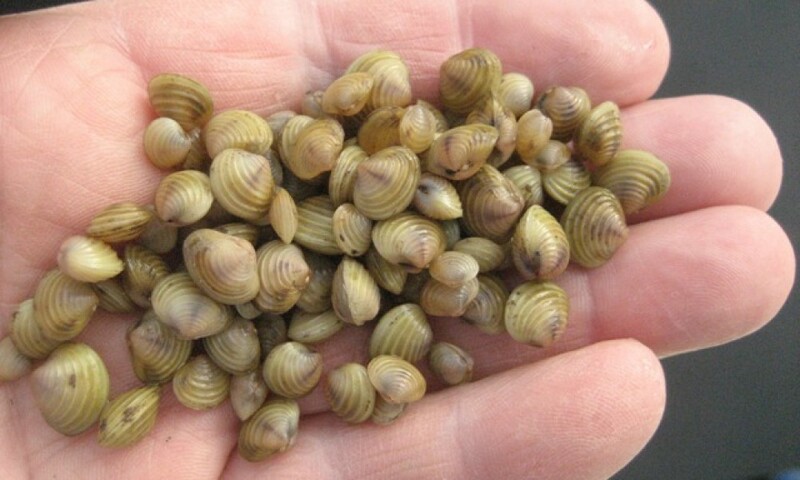 Zebra mussels and Quagga mussels usually occupy the same habitat and are often mistaken for one another. 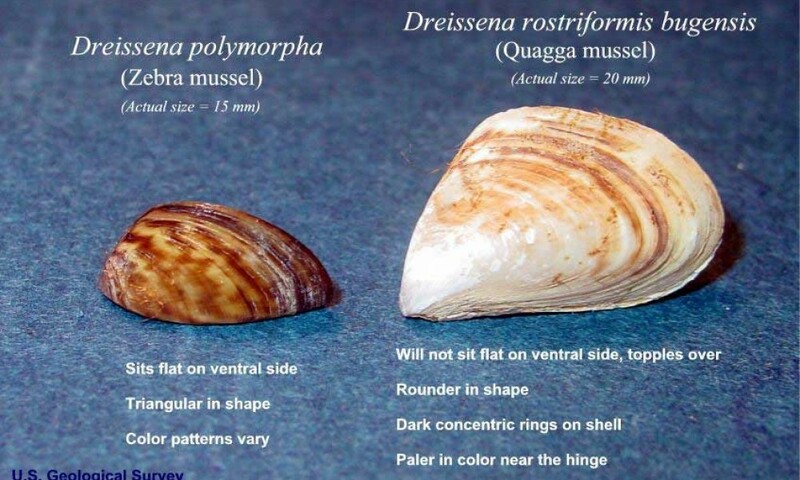 However, zebra mussels have a flattened ventral surface (underside) and therefore lie flat, while the Quagga mussel’s ventral surface is convex and will not lie flat. 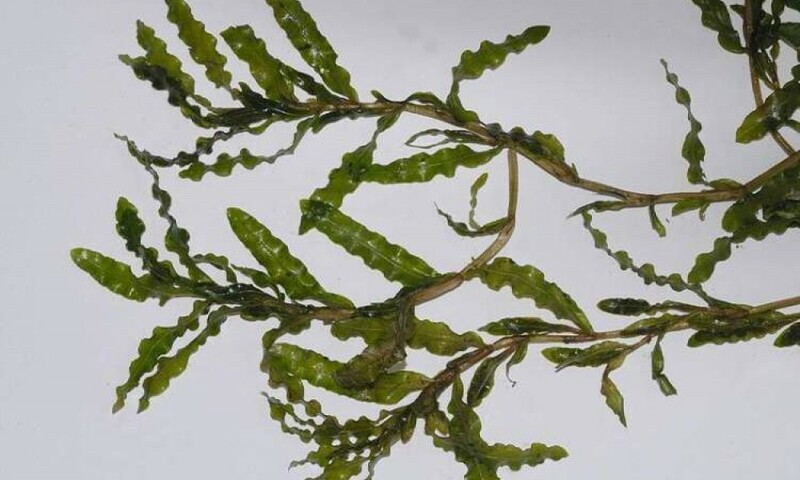 Curly-leaf pondweed: Long leaves that are somewhat stiff with wavy, bacon-shaped margins distinguish curly-leaf pondweed. 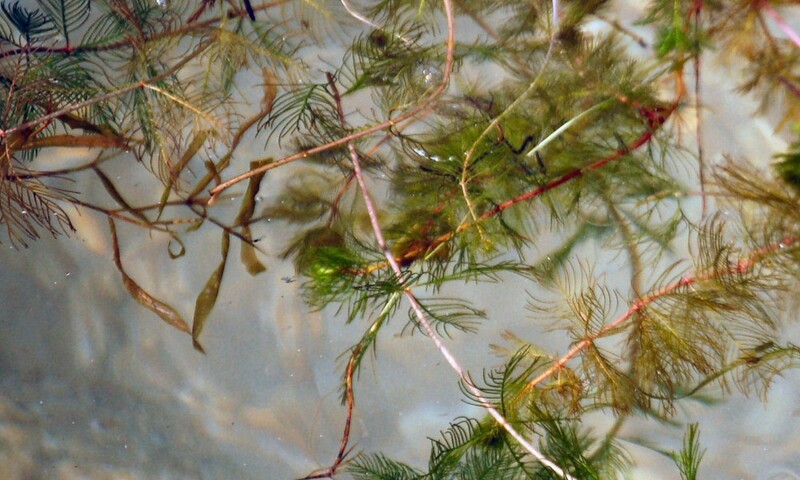 It is a submerged aquatic plant that produces winter buds resembling small pinecones. Eurasian watermilfoil: This aquatic invasive plant’s long, feather-like leaves form a whorled arrangement around the stem. This species grows in dense mats and feels limp when removed from water. 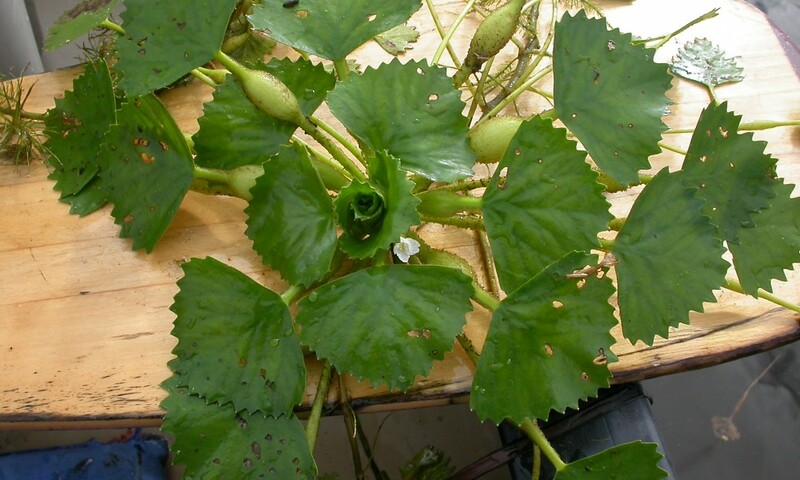 Water chestnut: Floating triangular leaves with toothed edges identify this submerged aquatic plant, which produces a white flower when in bloom. These plants create expanses of dense, floating mats that deplete water bodies’ oxygen and, then, result in large fish kills. Be aware that water chestnut can easily get caught in fishing gear and boat propellers. Hydrilla: In the water, these rooted plants grow tall, vertical stems that branch out horizontally near the surface to form dense mats. 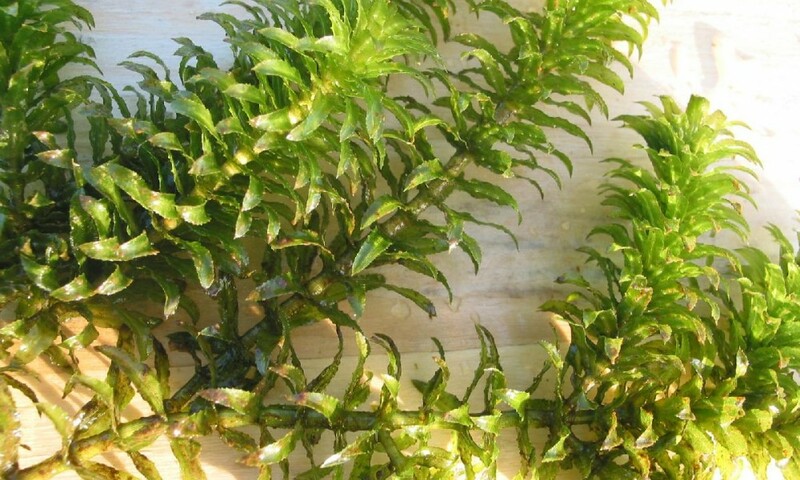 Hydrilla has small, pointed leaves with serrated edges that form a whorled arrangement around the stem. “What kind of bird is that, Lizzy?” I heard Paul shout. It was our last hurrah before graduating from SUNY Oswego, so my friends and I decided to head out to Chimney Bluffs State Park on Lake Ontario one last time before we all departed. 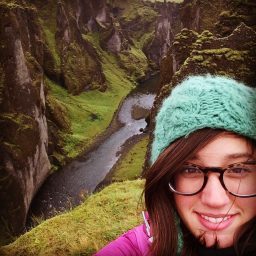 I followed the vector of Paul’s outstretched arm to see a large bird soaring through the air, gliding along the contour of the bluff where we sat, with its wings outstretched. I squinted. The bird had soared directly into the sun, and I could barely see. “Probably a turkey vulture,” I said unenthusiastically. But as the bird emerged from the blinding rays, I saw the bright yellow beak, glistening white head, and chocolate brown plumage. It was unmistakable; we were about 25 feet from a bald eagle. I jumped out of the grass, and my friends followed, as they, too, recognized this large raptor. We broke out in cheers and hollers that cut through the melancholy of our impending departure. It was an unforgettable moment, but one that probably wouldn’t have been possible without a man named Peter Nye. Fast forward to today, I sit in a coffee shop waiting to meet with Nye, my wildlife management professor from a few semesters before. It had been hard to schedule a meeting with Nye, an opportunistic adventurer who seizes upon whatever outdoor excursion comes his way. Our meeting is sandwiched between a climbing trip and his volunteer work for Habitat for Humanity, which is soon to be followed by his trip to hike the 100-mile wilderness in Maine – what a retirement and certainly a reward for his quintessential career as head of the Endangered Species Unit for the New York State Department of Environmental Conservation! At the start of his career in 1974, the bald eagle population had plummeted due to the use of harmful pesticide DDT, which hampered the eagles’ ability to reproduce. “The eagle work was there,” said Nye. “There were no climbers, and no expertise. 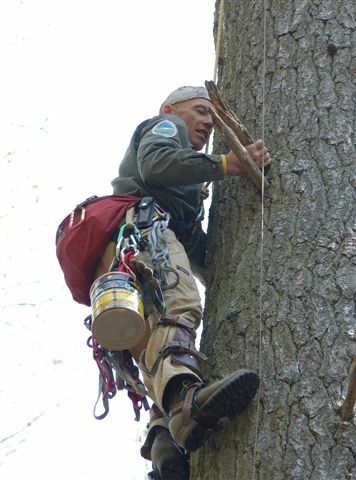 So, we got the spikes and the belts, and I developed the expertise.” Thus began a 13-year project centered around a falconry-technique called hacking, which involves climbing 100 to 125 feet up into the trees to harvest nestling eagles and then rearing and releasing them into suitable habitats to grow and eventually reproduce. Nye adapted this technique specifically to bald eagles with the help of Cornell ornithologist Tom Cade, who had some experience with the technique. 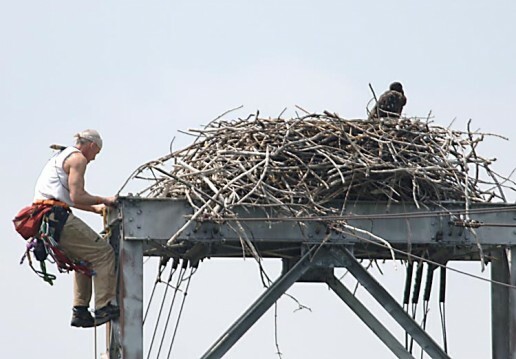 The first release site, and home to the world’s first bald eagle hacking tower, was located at Montezuma Wildlife Refuge on the northern end of the Finger Lakes’ Cayuga Lake. Each tower contained several caged compartments, where staff raised and cared for the eaglets. Eventually, the cages were opened, allowing the young eagles to begin to hunt and survive on their own. “No one had ever done this before with bald eagles. It was a complete crapshoot,” Nye said. Bald eagles are altricial birds, which means they are born in an undeveloped state and learn to hunt and feed from their parents. “It was hard to say at the time whether it would work,” he explained. The DEC also worked with existing mated pairs by placing “dummy” eggs made out of plaster in their nests, which the adult eagles incubated and cared for. After the approximate two to four weeks of incubation time, staff replaced the eggs with bald eagle chicks. In essence, they were tricking the native pairs into rearing a hacked eagle chick. With no idea if this approach would be effective or how long it would take to be successful, Nye embarked on a 13-year project in 1976. Just four years later, two eaglets were found 84 miles away from their release point, and they were reproducing! “They were brother and sister, but hey, I’m not asking any questions,” Nye said with a smile. But when Nye and his team finally did arrive in Alaska, they mapped out the eagle nests, split them up, and divided them into two teams, who would climb up to the nests and harvest the eaglets. Nye reflected on the first challenge: “I got to the first tree, and it was this huge Sitka spruce. It was just a wall. That was a moment of reckoning for me. We had spent years planning and came all this way, and now, it was time to do it. 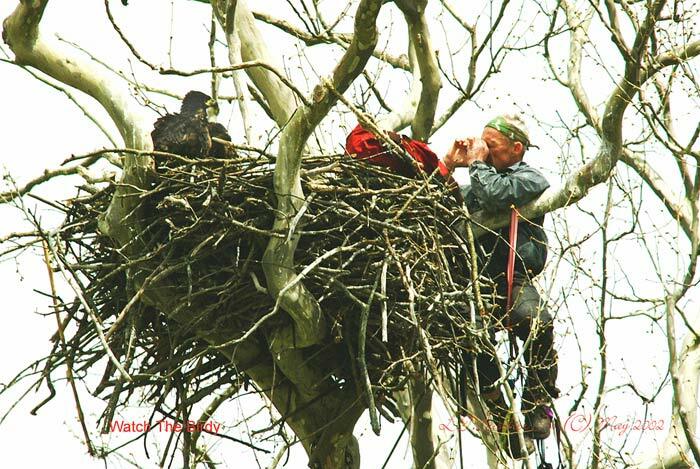 There was nowhere to grab – it was just fingernails the whole climb up that tree.” The trip was ultimately successful, and thus, Nye returned to New York with 21 eaglets to be released in various predetermined locations. The hacking program was successful beyond anything they could have imagined. The goal initially was to establish 10 breeding pairs. In 2010, New York had 173 breeding pairs, fledging 244 young with a 10-percent rise each year. With such success, it wasn’t long before wildlife managers in New Jersey, Pennsylvania, and Massachusetts were calling him up to ask for help in implementing the same programs in their home states. Nye’s work rippled through these neighboring states as he assisted in the development and implementation of plans tailored to their bald eagle populations. According to data reported by the USFWS, the bald eagle population in the lower 48 states has increased from 487 in 1963 to 9,789 in their last national survey, taken in 2006. As a result, the majestic bald eagle is no longer an uncommon sighting and is once again occupying our landscapes and enriching our experiences in the outdoors!